Are You Geechee or Gullah? I grew up with a clear understanding the there was something different about the Geechee and Gullah people. The distinction was often identified by the accent that didn’t sound quite Southern and didn’t sound quite Caribbean, but was uniquely a combination of both. I could hear it in my mother’s voice when she got angry at one of us kids or in the coded conversations that I overheard between my father and uncle. I could see it in the profile of my grandmother face with clear Native American feathers and sun drenched sienna skin, straight black hair with flickers of red that would glow like embers when the light hit her face just right. The language and the culture was what I believe to be African-American with no rhyme, reason, or weight behind the history. Kind of like being “just because”. I didn’t consider the history behind the way my family spoke, or the way my family looked, or why my family did so many of the things we did. At times, I couldn’t tell if being called Geechee (Gullah) was a compliment or a criticism, but I didn’t know enough to defend the ways of a culture that I didn’t understand – even though I was a part of it. In fact, I often denied that part of myself and besides – no one asked as I got older, so to me, it couldn’t be as important as being from Spain or Mexico or Germany with languages that were celebrated and seen as exotic and speakers that were considered bi-lingual. The language my family spoke at home was only allowed to be spoken at home. Outsiders saw our way of speaking as unintelligent, ignorant, and inferior. I know now that that is so far from the truth. Now, I try to educate any young person in my family with the information that I couldn’t share outside my own home while growing up. The Gullah and Geechee culture on the Sea Islands of Georgia have retained ethnic traditions from West Africa since the mid-1700s. The islands comprise West African decedents but are distinguished between Gullah (islanders in South Carolina) and Geechee (islanders on the Sea Islands of Georgia). Early this fall, I took my Goddaughter to the Geechee Kunda Museum in Liberty County and to the Gullah festival held on Sapelo Island, Georgia to learn more about the history of my ancestors, the language of the culture, and the men and women who were enslaved on the coastal plantations that stretched from South Carolina to Florida. The museum seeks to preserve the Geechee culture – an African-based culture that has developed in coastal Georgia. The museum is situated on former rice, cotton, and sugarcane plantations to honor the men and women enslaved on the land. An aura of respect envelops the entire property – in the front of the museum is an adobe hut, built to honor the Native Americans who had inhabited the land prior to the plantation owners. The museum is run by Jim and Pat Bacote, who are leading the movement to preserve the Geechee tradition in the area. Jim and Pat lead us through numerous workshops detailing the history of Africans arriving to America from West Africa, the traditions that were preserved in America, accounts of slave life, and instances of civil disobedience carried out by the slaves. Each one was moving and incredibly thought provoking. One of the most emotional experiences from the trip was when the museum historians (Elders) outlined for us through a series of hands-on demonstrations the rich and robust economy that was developed from the slave trade. For many years, I thought that slavery was an issue of race. As I got older, I recognized that slavery was a matter of money, and that race became a convenient distraction as a result. The workshops and demonstrations reinforced that view. The Elders pointed out that there was no way the institution of slavery could have survived if the enslaved people didn’t have the necessary skills to work the land; that the slave traders intentionally went to an area of the world where people were dependent on the land – and chose them for that specific reason. In another workshop, we learned how slavery contributed to the underdevelopment of the African continent. One of the museum Elders walked us through an exercise where we simulated the collapse of African communities from the slave trade. Each person represented a skilled tribe of 100 people, and we saw how integral each tribe was to maintaining a functioning inter-tribal trading economy. We then watched the system break down as tribes were taken away and sold into the slave trade. The entire experience shook me; I had never really stopped to consider how the slave trade had stripped the fibers of what Africa could have been. It was heartbreaking to follow the chain of events between the dehumanizing actions that took place hundreds of years ago to the injustices and class divisions that we see today. We ended our day at the museum with a performance from the Geechee Kunda Performers – the “original shouters,” who introduced the Geechee Gullah language – a blend of English and African languages, that was born on Africa’s slave coast and developed in the slave communities of isolated plantations in the coastal South – through a very funny demonstration with an interpreter. They concluded with a song and dance and an open invitation for participants to join in! We danced and sang, paying homage to our ancestors who had performed these dances and sang these songs hundreds of years ago. 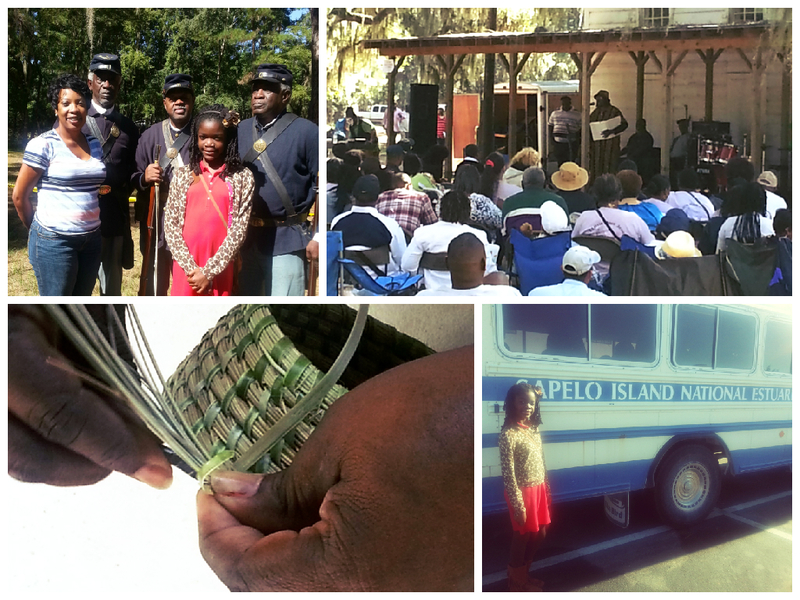 The next day, we took a ferry across Doboy Sound to Sapelo Island and joined the festivities of the Gullah festival. It felt like the largest family reunion I had ever seen. There was food-a-plenty and it was so good! The menu would not have been considered healthy, but it demonstrated the creativity and resilience of a people that were forced to make delicacies from the scraps of their slave owners. History and storytelling was delivered on the porch of the only church on the island. Approximately 115 people now reside on Sapelo, a community that is primarily composed of the descendants of slaves; their diminishing numbers are a source of concern. Cornelia Walker Bailey, the most prominent spokesperson for the community, has long been a champion of preserving the rich West African heritage, from spiritual beliefs and folkways to the Geechee dialect once spoken by the island’s African American residents. In 2000, Bailey published a “cultural memoir” of her life and the struggle to preserve these traditions. What an honor and a privilege to share this time with my Goddaughter. It’s my responsibility to help her understand that African Americans did not just “arrive” to America, and to make sure that she and all the other young people that I mentor know that there is culture and history that they come from and that it should never be denied. Gullah proverb: Evry frog praise e ownt pond. I remember meeting my first Carolinian Geechee person. I asked if she was Caribbean or had Caribbean roots. She said no, and I remember being completely lost as to how she sound like my whole entire family (I’m West Indian) and had no Caribbean roots that she was aware of. This interaction happened in 1994 – before Google, therefore I did not have a way to learn about our beautiful connection. Thank you for this learning tool. I was born in Brunswick, Georgia in 1960. I think about moving back there all the time, but I must wait upon the green light from Father, Son, Holy Spirit, as this is will not be by my will, my strength, my might, nor my power, but by word and truth of the Trinity. Should it be by the word of God, I shall reside on Sapalo Island, a place of peace and blessed humility. Please visit my website at: troubledwatersministry.org. I need to have spiritual interaction with someone. There is something I’m missing in the latter days of my living days. I have been on a very long tumultuous journey. I want to come home. My sister know a lot about my heritage and she told me my grandfather was a Geechee. It was my father’s father I just searching for answers. I really don’t know what I am looking for but I would like to know it we have family out there so we can get to know each other before Christ comes back for us I know we don’t know the hour or time but I do know he is coming back. I have been looking for a place call Geechee town. My family move from Georgia in the 1936’s. My grandfather was Geechee. family came from the Savannah area. which area I do not know. He use to work in the Savannah Shipyard as a cement masion. In 1928 to 1935. His name was Thomas veal My mom was born in 1932. All she remember is they would go over to the islands to visit family. They would cross the vidox to get to Geechee town. My Grandmother Maiden name was Maggie Hawkless. Both where born Grandfather 1912 and grandmother 1914. We also have family in Cockrand Georgia. I found out about the Gullah/Geechee culture when I show my mom a article. About Africans in the Carolinas. She was shock and said she knows this. I was shock too. Please if you have heard or know of the place they call Geechee town. I would like to find out more about it and the Geechee That still live there. I have been searching for about 6 years now. I have tears in my eyes, I, and my sisters and brothers were always told by our mom that we were highland Geechees, both of my parents were born in South Carolina (Bamberg county) so was I, so that accent was not as pronounced as lowland Geechees,,,,you don’t know how happy I am to learn the true history and I can’t wait to spread it with all my family……GOD bless you! I, like our yourself was always told of their Geechee heritage. My father would tell me stories of his father that passed when he was 4 but always remembered his different dialect of speech. He would always mention the name Jennings but our last name is Harris. My father grew up in the Quitman, Georgia area but also mentioned of family in Savannah. Geechee Indians people are descendants of Sierra Leone in west Africa brought over through the trans alantic slave trade. Geechee people lived in the same area with Seminole Indians. I am not really clear if they are mixed with Seminole or not or if they were adopted into the Seminole tribe. My Great Grandfather was also a Geechee Indian and supposedly had Seminole ancestry. My grandfather told me this year that we are geechee on his father side. I would like to learn more. I am Courtney Goudy from california. My grand mother told stories passed on geechee traditions to me. I have trying to bridge the gap. I want live in totality of the understanding my hertiage. Interested in any Gullah Geechee information and learning what parts of Africa derived? There is so much in my heart to say. My family just lost one of our last living elders, my grandmother. She told me stories of my great grandfather Henry who was full blooded Cherokee Indian and how he married my great Grandmother Pearl who was full blooded GeeChee. I had NO IDEA what any of this meant. I didn’t understand the significance of the two cultures. One being so well known and the other being tossed aside so carelessly. We were always told that we are most emphatically not African. But my heart knew differently. I wanted to know what Geechee was and why it was so important. I wanted to know what the culture was and finally know who and what we really are. Where we come from. What we ate. What language we spoke. Did we sing? Did we dance? This post has filled my heart so much. I am so excited to dig deeper to know more. I fully intend to completely submerge myself into our culture like a pig to mud. This is the breath of fresh air I needed. Thank you for sharing your experience. I greatly understand your quest and am stopping to comment because of some of the . One being the stories I remember my father always telling me of how his father was Geechee and moved further inland in Georiga where he married my grandmother who was native american and had long silver hair. My father grew up in Quitman, Georgia but also mentioned that we had a lot of family in Savannah. He would tell me his father passed when he was 4 but he remembered him speaking differently and in different pattern. After him passing they didn’t speak that much about him but every now and then he would learn more. Later on a group of our family decided to move to Tampa. I don’t know much more but am searching to reveal what has been hidden and forgotten. We live in Tampa also. Could you possibly be related to Boston Baggs of Liberty County, GA? He was enslaved their and moved to Sumter Co., Fl. We recently drove to Liberty Co during the holidays, to do family research and did not know about the museum. So sad we missed it. I was told by an old man that I was geechee my first time meeting him. I just learned about them like a month before he said he could tell by my nose and deep voice I’m a woman so I definitely believe him. My father’s family from Rochelle ga and my mom from somewhere near Jacksonville. My full sister took one of the test and we are 96% African just about all over and the rest is Native American. I do know my great grandmother is Native American but that’s all. I don’t have any history I would love to know if I’m apart of something. My great grandfather was mark cole from Tampa Florida he was geechee I met him once when I was 5 years old. My grandmother was Katherine cole. I never met her. She passed away before I was born. My mother Donna Burr also passed away. I was trying to find my family members and learn more about the Geechee culture. My great grandfather was geechee! His name was George Washington Drumgo and he was from Alabama, and he married my great grandmother who was Cherokee ” Indian” from Florida, her name was Theresa Grooms. As a child my grandmother would tell stories of how people made fun of them because they could not speak English. She also said how she worked in the cotton fields and on a farm. I wish she could give me more history information about her family and childhood, but she’s old now and her memory isn’t the same. All this time I just thought my grandmother was country, because of the way she spoke. I didn’t realize I had history/rich culture right under my nose. Now, I understand her strong will, and compassion for others and life. It all makes sense to me now. Reading everyone’s post informed me that I’m not alone in learning more about my ancestors. I wish everyone success in locating their love ones. GOD BLESS! When I lived in Charleston, it was said to me that Geechee also meant that someone who is of Gullah culture was born between this river and that river? This is going back a long time ago. Pls. advise. Thx! Wow!! My mother told me at a young age that my great grandfather’s name was Geechee Johnson and my great grandmother was a full bloodied Blackfoot Indian. After doing a little research I’ve found that Geechee is not a name but a nation of MY people. May be that was his nickname because of his tribe. I want and need to learn more because it is extremely fascinating and exciting to know what I have learned about my ancestors thus far. It is important to know about my people so I can honor their traditions and pass them along to my son. Thank you for sharing your story! I am searching for information about my grandmother. My now deceased father said she was part Gechee. My mother said it’s not so. How can I find this out? My mother’s father was born in 1901. My Mom said her dad was Geechee. He left South Carolina as a young child and ended up in Alabama by way of New Orleans. Would like more info on Geechee. My name is wesley campbell. A native gullah geechee my family has worked, lived and flourish with I. The sanctuary of Hilton Head Island. I have a great deal of respect for the hardships and triumph which many of my forefathers diligence and love of family it has instilled into me. My father Wesley Campbell senior has been a staple on the island for over 50 years, selling freah seafood and produce to tourists and locals. As I grow older and more aware of the path that has brought our culture into the modern age the work my daddy has done makes me very proud. My mother and father’s wedding was arranged in Portageville, MO. He was a sharecropper and 10 years older than her . She was not very happy about that. When she did answer any questions about him after she left him, she would tell me that he was a Geechee and you couldn’t understand what he was saying. His name is David L. Williams and he is deceased. He had many brothers and family members. I don’t know any of my family on my father’s side. I don’t remember his mother or father’s name. I just remember the name uncle George who is one of his brothers. My mother’s great great grandmother who arranged the marriage is Indian. Her name is Sarah Richardson. Are there any Geechees with the last name of Williams. Wow! I’m amazed and I hope that I too can locate my family and learn more about them and our culture. My maternal grandfather was from Stapleton or Sandersville Georgia. I have been trying to locate information on his mother’s family, her married name was Lillie Habersham born around 1870 (husband was Cesar Habersham) and I believe her maiden name was either Harmon or Jackson per her death certificate. Her mother is listed as Polly Jackson and father is Phillip Harmon. Hello, I am beginning my venture thru the Gullah/Geechee experience. My grandfather (my mother’s father) was born in South Carolina, James March. His Mother’s name was Susian (but found to be spelled differently on different documents. As a child, I heard many family members call my mother Geechie. I just assumed it was a nickname. While researching my family history (both sides), I came across this site about the Gullah/Geechee. When I saw the word Geechee, I immediately recognized it. So, I asked my siblings about about hearing our mom being called Geechee, and they said yes. Another sister told me that our mom, and her brother and sister were Geechee. So, I’m now finding all this information and it is amazing! Growing up in Atlanta my brother and I were often teased about our grandfather on my dad’s side from Brunswick Ga was a “gueechie man” and talked funny! Recently I received my DNA results 43% Camaroon and 23% Mali the remain “mutt” combinations Ghana, Irish and Native American, all went to make me more interested in this Gueechie heritage. Thank you so much for publishing this information on the rich history and festivals for my heritage. I will be visiting the area next time I am home to do more research. My name is Yolonda Chrispen my father name is Joseph Chrispen my great grandfather name was Clayton Brown he was born on Brown ‘s plantation in Charleston , South Carolina he was full blooded Geechee Indians , I would like to know if you have any information relating to him . I am a descendant of the The Gullah and the Indigenous tribes of the sea Islands of South Carolina mainly St. Helena Island, SC and Edisto Island, SC. My ancestry is mainly the Gullah and mixture with the Yamassee and the Cusabo Indigenous Tribes…I did my ancestry dna and my result confirm the stories passed down to me thru my paternal Great Grandmother and other elderly relatives who have passed on to the Great Beyond…. My maternal Great Grandmother stated that we were descended from Creek Indians but we mostly came from Nigeria which is high in my DNA so most likely we descend from the Guale Indigenous tribes of the sea islands of Georgia who would be the Geechee on my mothers maternal side…mother’s, mother’s, mother….which is just a fraction but the majority of my family are Gullah from coastal Southeastern South Carolina…some from east central south Carolina..
and I am 2% Native American…but I have no East Asian DNA at all which go to show there is a difference between what most of us were taught in school that all Native Americans came to the Americas across the Bering Strait….The so called Native Americans did. There is a difference between the so Called Native American Indian the Yapethic seed that came across the Bering Strait and The True Indigenous Peoples of America who are of the seed of Shemetic Seed of the Holy Scriptures that came from Africa…All praises to The Most High and Honor to the ancestors…much love to my Gullah and Geechee family….WE BE GULLAH GEECHEE!!!! Amen..thank you for hogging my memory about the Berlin straight. Hi, I’m an older individual and one of 9 children, my youngest sister and I are trying to establish where our family originated in the US. My dad’s military record was conveniently destroyed in a fire at the department of military archives. We know very little because there is not oral history, but my dad and his brothers and sister as far as I know came from Virginia. However, I remember my auntie telling my uncle that he still acted like he was geechee and like his brother, my dad, loved and had to have rice with every meal. My auntie and uncle also spoke with a strange accent – not southern, not northern and definitely not English. Some times when there was excitement or argument you could barely understand what they were saying at all. My mother had seven children by my dad; he died when I was 3, and me and my two youngest siblings never got to know him; the older children don’t or won’t remember much. Do have any suggestions how I can start a search to find my paternal lineage? It’s sad to say but I’m at the point where I don’t trust DNA Kits – I believe that my paternal and maternal grand parents were a combination of Indigenous and Slave. This is so important because of the climate of white supremacy rising once again and the I believe that whites will try and have them deported. Paranoid, yes – because these people are believing that they own this land and if my family has even a minute chance of proving otherwise I want them to have it. My father said his mother was Gechee. My mother and a few folks in my fathers side say she wasn’t irbthat they don’t know. I can’t find any records until she married my grandfather. They were from GA and some relatives in FL. I will be in GA first of April and wonder if there’s some place I can go to find out if her family was at least part Gechee? How do I find out if I am decended from Gullah or Geechie people? Hey I am a Gullah known as (Golla) from West Africa Liberia. When I hear about the Gullah and the Geechie known as (Kisseh) in Liberia, I was impressed. I am currently living in Minnesota. How can I really be a part of this Gullah culture? I could give you people more information about the origination of the Gollah and the kisseh tribe of Liberia West Africa. I speak Gollah well. I will loved to be a part of my culture in America. Start on St Helena Island, Sc (Santa E’lena Island, Sc) home of the Gullah Geechee seat of the sea islands of nc,sc,ga,fl..
Hey family…my grandfather who raised me always told me we were geechee. His daddy was a geechee man named Prince Coleman Griggs and his mom was Lena Griggs. I dont have a lot of information, my beloved grandpa has passed on now. I wished I had asked more questions in my youth. He mentioned Lagrange and Charleston. I was talking to an African Art historian and collector and he stopped me and asked me if I was Geechee because he says I looked Geechee. Blew me away! I have a strong affinity for the healing arts and healing thru touch, food, music and art. He told me that was very “geechee” of me. lol Would really like to learn more and share with my children. Can’t explain it, but feeling a strong pull. Very informative. My great Aunt once told me at a family reunion in Tampa, Fla., that our family had Geechee blood. I always rejoiced at that thought and yearned to explore those roots. I visited Hilton island years late, not with that thought in mind, but on business. I was thrilled with the people i met who identified themselves as Gullah but saw no difference from Geechee. My wife purchased a DNA ancestor kit a few years ago, for my Father’s day gift, and sure enough my DNA was traced to the west coast of Africa. Mali, Ghana, Senegal, to name a few places. With time I plan to do more of the low islands exploration around Georgia. Peace. My grandmother would always tell my mother and my father’s twin sister that her father was a Geechee from South Carolina named Sam Harress. I have been trying to find any kind of evidence to what my great grandfather’s African name could have been so that I can possibly trace my roots. I also don’t know if I have spelled the last name correctly and believe it was probably given to him according to the slave owners last name. I did a DNA from Ancestry that came back I was 80% Africa. 22% Cameroon/Congo,22% Nigeria, 19% Ivory Coast/Ghana, 11%Benin/Togo, 2%African Southeastern Bantu, 2% African South-Central Hunter-Gatherers, and 2% Senegal. How do I begin to find the answers I seek? Hello my name is Alphonso Samukai I was born in Worcester, MA. My parents are from Liberia, and my Father is from the Kissi ethnic group that are native to Guinea, Sierra Leone, and Liberia. I was so fascinated when reading this because it’s good to know our culture didn’t die off when they brought our people over to America. Hopefully In the future I’ll get a chance to visit the geechee people of the Carolinas. I’m trying to find our some family history from my paternal side. Do you know of any Gullah or Geechee people with the surname Powell? I am Geechee born in Hendersonville, South Carolina. My Great Grandfather and his wife moved from Georgia to South Carolina looking for cheap land. They settled there and owned a rice field. My roots are from Sierra Leonne. The callus Gullah Geechie. So, if you’ve originated from Georgia, you’re considered Geechie. As a child my father often called my mother a “Geechee” but I never knew what it meant. As I look more into who I am I wonder if she truly was a Geechee. I am curious to find out. I was researching moving to towns on the water that had a nice amount of working decent black people in the area and of course it brought me to the Gullah/Geechee nation. I am finding out so much about myself and loving it.